My name is Ali and I live in Haslemere, Surrey. I am married with 2 daughters. I grew up in a musical family. Both my parents were teachers and we all enjoyed playing and listening to music at home. I played the violin and also sang in a band. My mother taught dancing in the local community. I enjoyed lessons in Ballet, Latin American, Scottish Country Dancing, Jazz and Tap Dancing. At university, I discovered a new passion – drama. I had many opportunities to perform in plays and also performed twice at the Edinburgh Festival. This gave me a lifelong love of the expressive arts and I soon realised how much we can all grow and learn as individuals through drama, dance and music. After doing an English Degree at university, I decided to train as a Primary School Teacher. I thoroughly enjoyed teaching, particularly spending time with the children and seeing their personalities and skills develop. I continued to teach music and drama at school for several years. Eventually I got married, moved abroad and had two children. When I returned to the UK, I discovered a local music class for my young children and realised how much they tuned in to the experience and how much it helped their development socially, physically and emotionally. 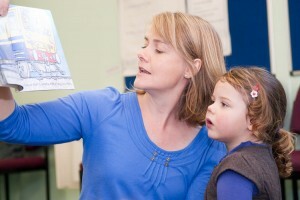 I decided to combine my teaching experience with all my creative interests and train as a Kindermusik teacher in 2005. I looked into many different Music and Movement programmes, but Kindermusik really stood out as having a strong educational basis. Kindermusik offers such an amazing variety of experience with music from all over the globe. It is a really exciting programme, but one which also delivers great benefits to a child’s development in all areas. I look forward to continuing my road of discovery with all of my Kindermusik families. Find out how to contact Ali here.